The lab activity described here was adapted by Erin Bardar and Sarah Hill of TERC for the EarthLabs project. In Lab 5, students learned about some of the global circulation processes that transport both matter and energy around the planet. In Part A they get a much more specific picture of the Earth system at the global scale as they investigate data collected by NASA satellites. 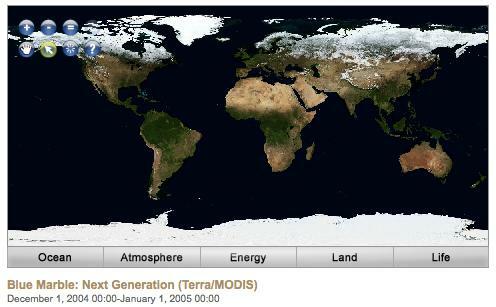 The data is displayed in image form in the NEO (NASA Earth Observations) data visualization tool. How do the four interconnected spheres show up at the global scale in these data representations? Is it possible, from studying this data, to infer some of the same interconnections at the global scale that were identified at the local study site? What can students infer from studying changes across the seasons? In Part B students play a game that focuses their attention on the global water cycle, but at the particle scale: what might happen to this molecule of water that falls onto the ground, or into a stream? Next they step back to the macroscopic scale as they diagram the ways in which water moves through the four interconnected spheres of the Earth system. translate their understanding of that pathway into an abstract diagram. In Part A: Students explore and compare Earth data sets using NASA's data visualization tool, NEO (NASA Earth Observations). In Part B: Students play the NOAA Water Cycle Game and create an abstract diagram of the global water cycle. For more information about the NEO visualization tool, the NASA satellites that collect the data, and the water cycle, read the section titled Background Information under Additional Resources below. NEO is a hands-on computer activity for students. While students can navigate their way through the interface and discover the options, it could save time if you gave them an orientation. The resource available in the background information (see below) provides a basic overview of the NEO interface. It also includes information about the analysis tool (ICE) that is built into NEO. Students are not asked to use the analysis tool in the Lab, but that's an option you can consider. Even without the analysis tool, there are ample opportunities for students to do non-numerical analysis of the NEO data. The resource below, The Water Cycle: Reservoirs and Fluxes, is for teacher background information, but you may also decide to distribute copies to your students. You can find similar diagrams for other biogeochemical reservoirs and fluxes on the Web, for example the Global Carbon Cycle from NOAA's Earth System Resource Laboratory. You can also review the diagrams students create showing the ways in which water cycles through the four spheres. Have they missed any significant fluxes? Have they added text to the flux arrows that accurately describes the process? Lab 5 activities have been correlated to Texas Essential Knowledge and Skills (TEKS) standards. Lab 5 activities have been correlated to the following National Science Education Standards. 12ASI2.3 Scientists rely on technology to enhance the gathering and manipulation of data. New techniques and tools provide new evidence to guide inquiry and new methods to gather data, thereby contributing to the advance of science. The accuracy and precision of the data, and therefore the quality of the exploration, depends on the technology used. 12EST2.2 Science often advances with the introduction of new technologies. Solving technological problems often results in new scientific knowledge. New technologies often extend the current levels of scientific understanding and introduce new areas of research. 12FSPSP4.1 Natural ecosystems provide an array of basic processes that affect humans. Those processes include maintenance of the quality of the atmosphere, generation of soils, control of the hydrologic cycle, disposal of wastes, and recycling of nutrients. Humans are changing many of these basic processes, and the changes may be detrimental to humans. NASA Earth Observations (NEO): A Brief Introduction (Acrobat (PDF) 1.4MB Jun28 10) can help you get started with the NASA data visualization tool. You'll find information about the NASA satellites that collect the data viewed in NEO (and much more) at the Web site of the NASA Earth Observing System Project Science Office. The NASA Earth Observatory Web site includes an extended piece about the Water Cycle and the role that the satellite Aqua plays in helping us better understand that cycle. The Water Cycle: Reservoir and Fluxes (Acrobat (PDF) 114kB May15 13) is a diagram that represents the seven reservoirs of water in the Earth system, and provides the rates at which water moves among those reservoirs.